In anything you do, always do your best! Can eight simple words shared with a 10-year-old help shape a life? These eight words sure did. I was the ripe old age of 10 when eight simple words that would help shape my life were shared with me by a man I would meet just once. That man was Jim Houston, a two-time All-American at Ohio State University who played linebacker for my beloved Cleveland Browns. Back in the day, the Browns were perennial contenders for the National Football League title. In fact, they would win the NFL championship in 1964, the year I met Jim Houston. I was part of a Cub Scout pack at Dentzler Elementary School in Parma, Ohio, and one of the boys’ parents must have had a connection with the Browns or Jim Houston himself because he came to our school one afternoon to speak to our pack. I couldn’t tell you what Jim said that day, but I do remember us boys lining up for autographs from our football hero. Unlike some of the boys, I did not have a football for Jim to sign. Indeed, I must not have realized he would be signing autographs because what he signed for me is a piece of notebook paper ripped out of a binder. It turns out my lack of foresight worked in my favor, because I got something far more valuable that day than an athlete’s name scribbled on a football. I got a piece of advice that has stuck with me for a lifetime. Remember — in anything you do, always do your BEST! I believe most of us don’t realize the impact, positive and negative, that our words can have on the lives of others. 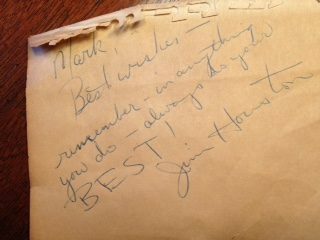 To say the words that Jim Houston shared with me 55 years ago had a positive impact on my life would be the height of understatement. I saw those words every day for the next dozen years or so. I carefully tucked that piece of paper into the corner of my bedroom mirror, where I was sure to see it as I got ready for school. I took that piece of paper with me when I went off to college and pinned it to the cork board behind the desk of whatever dorm room I occupied or house I lived in. I know it sounds corny, but the words on that paper would serve as a pick-me-up when I was down and inspired me to renew my efforts to do the best I could at whatever challenge came my way. By the time I graduated from college and went on to the working world, the words were ingrained in me. During my four decades as a newspaper writer and editor, I would give my best effort to whatever I was working on, whether it was a big Page 1 story or a three-paragraph filler piece buried inside the paper. I enjoyed a wonderful, successful-filled career because of that work ethic. But I have come to realize over time that Jim Houston’s advice covers a lot more ground than how I approach my job. After all, “anything” is a pretty all-encompassing word; it means I should do my best in whatever role I’m playing in my life. So, if I am being a husband to my wife, I should do my best to be the best spouse I can be. If I am being a father to my children, I should do my best to be the best dad I can be. If I am being a friend to someone, I should do my best to be the best friend I can be. I wish I could tell you I consistently have been stellar in those roles. But that doesn’t change the value of the advice or the truth of the words. And there is truth — biblical truth — in Jim Houston’s words. In other words, we should approach whatever tasks we’re taking on as though we were doing them for God himself and not just for people. You can’t strive for a higher standard than trying to please God, and God is blessed and honored when we do. I think Jim Houston knew that. He just put it in a way a young boy could understand. EXTRA DOSE: I deeply regret that I did not write this piece about Jim Houston’s words sooner, as he died last fall. I would have liked him to know the impact he had on my life. And there is something to learn from my regret. It is to say “thank you” as soon as we can to those people who have had a positive influence on our lives. The person could be a parent, sibling, spouse, teacher, pastor, friend or co-worker, or even someone who just touched our life for a moment. A little bit of gratitude can go a long way toward encouraging those who encourage us.